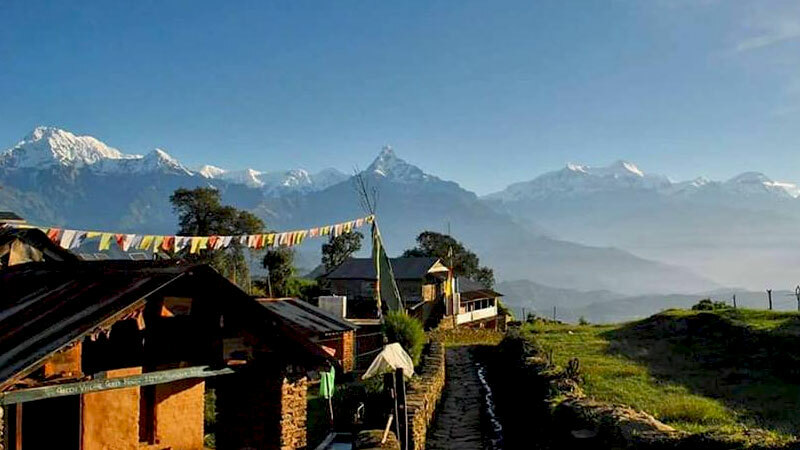 Short and easy Panchase Trekking from Pokhara offers the awesome views of the Annapurna Massif along with lush forest and beautiful flowers without hard walking. The trek can be done with family and better option to experience the village lifestyle, local culture, and observe the towering snow-capped Himalayas of Nepal. A religious place for Hindus, Panchase is also a part of Annapurna Region. From the hill of Panchase, one can have an aerial view of the towering Annapurna Mountain Ranges like Dhaulagiri, Lamjung Himal, Machhapuchhre, Manaslu etc. Your journey to this incredible trekking route begins with a short drive from Pokhara to Thadoo Khola. Prepare the backpacks and start walking along with the green forest. Bhumdi Village will be today's first camping destination of Panchase Trek. Likewise, the trail follows wonderful small villages like Panchase Bhanjyang, Chitre, and Birethati finishing the hiking at Nayapul. You will be driving back to Pokhara from this point. Day 01: Drive Pokhara to Thadookhola and Trek to Bhumdi. Trail Attractions: Stunning views of Pokhara city, Wonderful green hills and Annapurna Mountains. Max. Altitude: 1,520 m (Bhumdi). Day 02: Trek to Panchase Bhanjyang. Trail Attractions: Dense Forest and Annapurna Massif. Max. Altitude: 2,030 m (Panchase Bhanjyang). Day 03: Trek to Chitre. Trail Attractions: Magnificient views of Kusma Valley, Annapurna Range Himalayas, Pokhara City, and Mt. Dhaulagiri. Max. Altitude: 1,400 m (Chitre). Day 04: Trek to Birethati. Max. Altitude: 1,020 m (Birethati). Day 05: Trek to Nayapul and drive back to Pokhara. Trail Attractions: Green Hills and views of Pokhara Valley from Naudanda. Drop to your hotel. Panchase Trekking finished here! Pokhara to Thadoo Khola by private vehicle. Breakfast, Lunch, and Dinner during trekking. An English speaking professional guide. Trekking permits and entry fees. Nayapul to Pokhara by private vehicle. Breakfast, lunch, and dinner at Pokhara. Rest of all that are not mentioned in cost inclusive. Wants some modification on Panchase Trekking itinerary? contact us to customize it.